When you have a moment of peace and quiet, nothing can feel better than enjoying a relaxing shower. 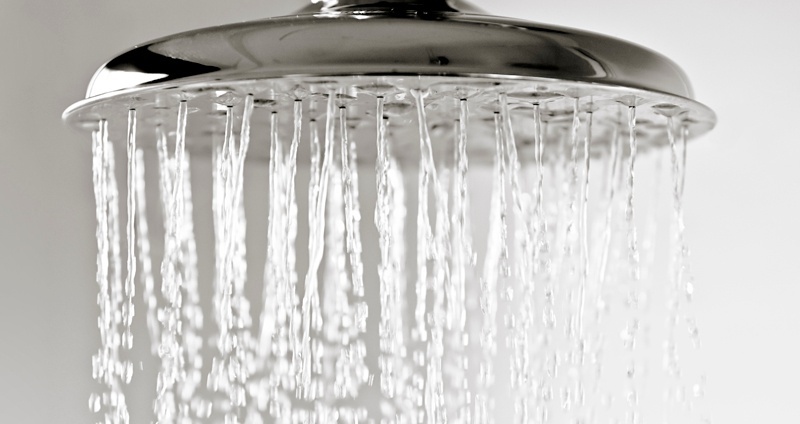 But what makes a good shower really great, and consistently one of the best parts of your day? Here are five things that will make your luxury showering experience stand out. This year, Moen's U will be released. With just a few taps on your smartphone, you can start your day with the perfect wake-up shower and finish your day with the perfect wind-down settings. Start your shower from the app and pause it to avoid wasting water (and time). Use the connected app to choose your perfect shower temperature before even stepping in. The app tells you when your shower is ready according to your custom-made preferences. A huge plus is that its ability to control water flow in up to four devices means that it can replace diverters. 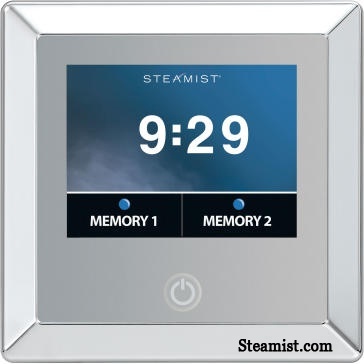 So rather than your shower looking like a battleship boiler room, you have one clean looking digital control. It will be very clear what head you are turning on. 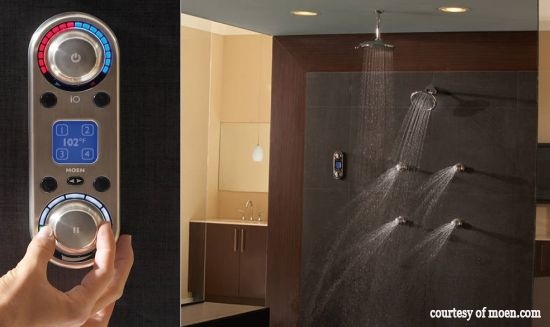 No more experimenting with a wall of boiler-room-like controls to figure out what turns on each of the shower heads, the body sprays, and the handheld. 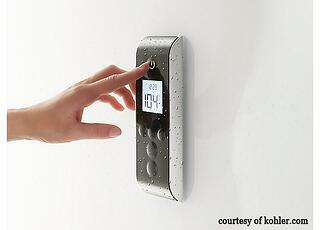 A thermostatically programmable shower has always been an important component in luxury showers. For many years, we have used the Grohe thermostatic mixer valve to allow each shower user to preset the temperature that they like and have the water to a desired temp. It's a great starting point for a wonderful showering experience. Available now, Moen's ioDigital system sets and monitors the water flow as well as the shower's water temperature, all with a remote. It has four presets that provide the exact water temperature and pressure desired, ranging from a warm, gentle morning shower to a cool, high-pressure, post-workout shower. 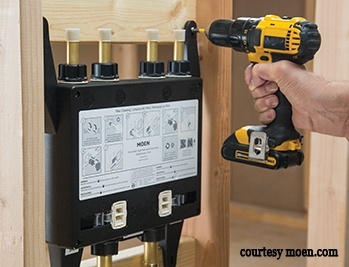 The Moen iodigital's remote control operates from a distance of up to 30 feet. Your morning routine no longer needs to include a stop at the shower to prewarm it while you are having your coffee. Hit the button for the showerhead that you want while you're still in bed, and by the time you open the door, it's up to temperature and ready to go. Here's the manual. It's pretty cool. And Moen's U will be even cooler than that! Can U wait? The other currently available alternative is Kohler's DTV prompt. It has similar functionality to Moen's iodigital, minus the remote (although you can have a second interface outside the shower) and three outlets not four. Our happiest showering clients are those who choose both a really good quality shower head and a handheld. Good quality handhelds run head to head performance wise with good shower heads, and the combination of handheld and rainshower head or other high performing shower head sets the stage for a high performance shower experience. A handheld can't be beat for washing the dog after you take him for a trail run, cleaning the shower or even hosing down your kids. Any everyone loves a rainshower head. There are rainshowers that hang from the ceiling, in various sizes up to 16" in diameter. Ceiling-mounted square shower heads are becoming an increasingly popular choice for the modern bathroom. Originally seen just in luxury hotels, they are ideally suited to cutting edge interior schemes. 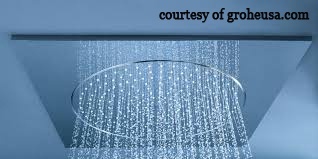 Without the need for a shower arm, the shower head is fixed directly to the ceiling giving the illusion that the water is cascading from the ceiling. Grohe's Square Rainshower F series collection in three sizes, from 10" to 20", offers this sleeker look with minimalist design. If you liked the idea of the controlling your shower remotely, you'll like the fact that there's an F Series Digital with a remote, that allows you to control the F series heads. These integrated shower heads give you the rain shower feel without the intrusive look that a big head dangling down from the ceiling can give a shower. Then there is Nebia, a shower head coming out this year that is revolutionizing how we shower. It is a Kickstarter project. By atomizing water into teeny particles, more water comes in contact with your body, giving you a better showering experience, leaving your skin feeling clean and hydrated, yet at the same time using 70 % less water than the typical household shower head. Their H2MICRO™ technology atomizes water into millions of droplets to create 10 times more surface area than a regular shower. For the average U.S. home, Nebia pays for itself in less than two years. Wow. Steam feels good, especially after a workout, or a hard day. It relaxes and soothes sore tired muscles and helps you relax and let go of stress that builds up during your day. It's a welcome respite for allergy sufferers, as well as those with asthma and other respiratory problems. It provides extraordinary help in sinus improvement and breathing. Steam fuels blood flow, banishing impurities and toxins from your body. It hydrates your skin with warm penetrating moisture, and can help it stay soft and smooth, almost defying Father time. Many custom showers are built with steam. Now everyone can have one; Mr. Steam has come out with some reasonably priced compact steam units designed to fit even smaller showers. Go for one that has a cool to the touch Aroma Steam steamhead that can hold essential oils for aromatherapy. For the gadget minded, Steamist has an iPhone programmable digital home spa system, with the TSC Touch Control. It allows two user preference profiles to be set up via iPhone, controlling as many as three water features, as well as up to three Spa Options (light, aromas or music). Regardless of whether you go for simple or fully featured, there is nothing better than a steam shower when it is cold and bitter outside. It's like an oasis throughout the year. Once you have one, you will wonder how you ever managed without. A spot for everything and everything in its place. Nowhere is this more important than in the shower. There's your stuff. Other people's stuff. The dog shampoo. The mirror for shaving. A shower niche is a great place to organize your toiletries. 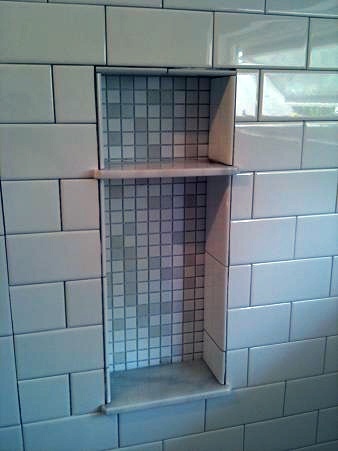 The items to be placed in the niche will determine its width and height and whether you need a shelf in it. Often times, the niche is placed at eye level so it may be one of the most prominently seen features. This is a good spot for it functionally - you don’t want to be reaching above your head or bending down. If adults and children are using the same shower, 2 niches - a low niche for the children and a higher niche for the adults -should be considered. We sometimes place a lower niche aside a shower seat for liquid soap and shaving items. 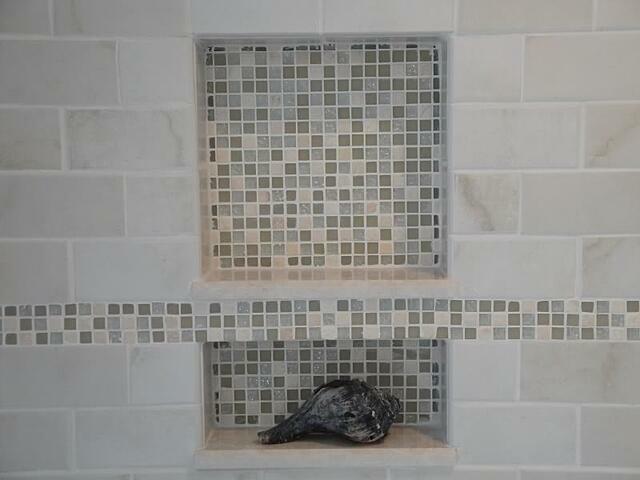 Some niches are meant to highlight a particular tile. 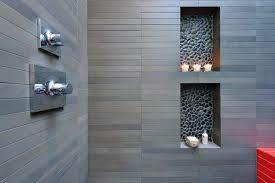 Others are just functional, and meant to blend into the tile pattern and be simplicity elegant and clean looking. The final design details are what make a difference in the final "look" and this is always a topic of much discussion in our design studio. Most custom showers have a lot of very fancy beautiful tile in them. Even if you have a frameless shower enclosure, the glass itself can effect how your tile looks. 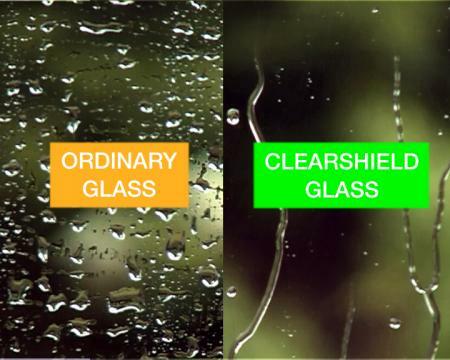 As clear glass gets thicker, like the thicknesses used in shower doors, the green cast becomes more noticeable. If you want to display true colors that are seen through glass, Starphire glass is key in allowing you to do so. Starphire Glass is a lead free, low iron glass product with less green on the edge of the glass. 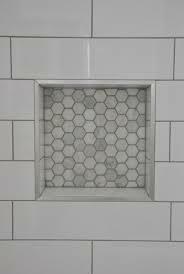 This glass minimizes & the color change of the white wall or the tile behind it because it is a "whiter glass". (For a visual comparison, you can see it on display alongside regular shower glass in the Clark Construction showroom.) The use of Starphire glass allows the colors to stay "true to life." To keep your glass looking new, making it easier to clean and resisting staining and discoloration, ClearShield, a protective coating, can be added to the glass. It works like ’non-stick’ cookware on glass surfaces. ClearShield not only protects shower glass from harmful contaminants that can otherwise damage or permanently etch the glass surface, but it also makes cleaning your shower glass much easier and resists staining , water spotting and discoloration, so common in our area of the country with its inherently hard water. Those of us who love our showers consider the showering experience like embarking on a journey without ever leaving home. Many of our clients, who first enjoyed steam in a spa or health club now want to bring not just steam, but that whole relaxation package experience home. The availability of some great new products, and our interest in great showers have lead to some awesome master bath projects for our clients. Each one seems better than the last!